On a recent adventure to Sri Lanka I had an extremely fun week staying in Soul and Surf. In the beginning there was 24 strangers from all corners of the earth, all under the one roof participating in daily yoga, eating all meals and surfing together. By the end of the week we were no longer strangers and I was lucky enough to have this lovely bunch along with all the crew at Soul and Surf sing “Happy Birthday”, to me with a freshly made Banana cake. Kabalana Beach at Sunset, Sri Lanka. “the only people for me are the mad ones, the ones who are mad to live, mad to talk, mad to be saved, desirous of everything at the same time, the ones who never yawn or say a commonplace thing, but burn, burn, burn like fabulous yellow roman candles exploding like spiders across the stars and in the middle you see the blue centerlight pop and everybody goes “Awww!”, (Jack Keroauc, On the Road). Each day commences with a 6:45am Vinyasa Flow Yoga session, followed by a light snack. Surfers head off to catch some waves whilst Non Surfers (Me) visited tea plantations, had one to one private yoga session tailored for pregnancy, learned how to cook delicious Sri Lankan food and relaxed with pregnancy tailored massages. These Non Surfer activities were spread throughout the 7 day trip over the course of the day. View from the Yoga Studio. Once all the Surfers returned there was a communal area for breakfast and it was served at 11:30am. This was a nice time to catch up with the group. Lunch was served around 2:00pm. There was time to chill out, soak up the vitamin D or read a book when the rain showers appeared. Lounging Area to chill out and catch up. In the evening around 4:30pm Surfers would head off for an evening surf and upon return snacks were provided followed by dinner at 7:30-8:00pm. As a Non Surfer I was able to chill out on the beach, dip my toes in the sea and take some snaps. Fisherman at Kabalana Beach, Sri Lanka. Evening Sunset and Surf, Kabalana Beach. Another magnificent Sunset, Kabalana Beach, Sri Lanka. Local Woman in Sri Lanka. Below are a colourful display of the delicious food served at Soul and Surf, Sri Lanka. If you have special dietary requirements, email beforehand and they will accommodate meal requirements. There was a mix a vegetarian and meat based options mainly chicken and fish. Art work in the Dinner Lounge. Coconut Porridge. Breakfast Fruit Platter. Lunch Salad usually served with Chickpea Burgers or Wraps. Dinner and the Sri Lankan Cookery Class included Sri Lankan Dahl Curry, Coconut Sambol and Tempered Potatoes. There was fresh prawns served too. Coconut Sambol is a traditional Sri Lankan dish made with coconut and spices. How to get to Soul and Surf? Airport pick up is organised with Soul & Surf Head of Vibes prior to departure. The drive is between 2.5hr -3hrs depending on weather conditions. Being six months pregnant I opted for the Non Surfer Package. 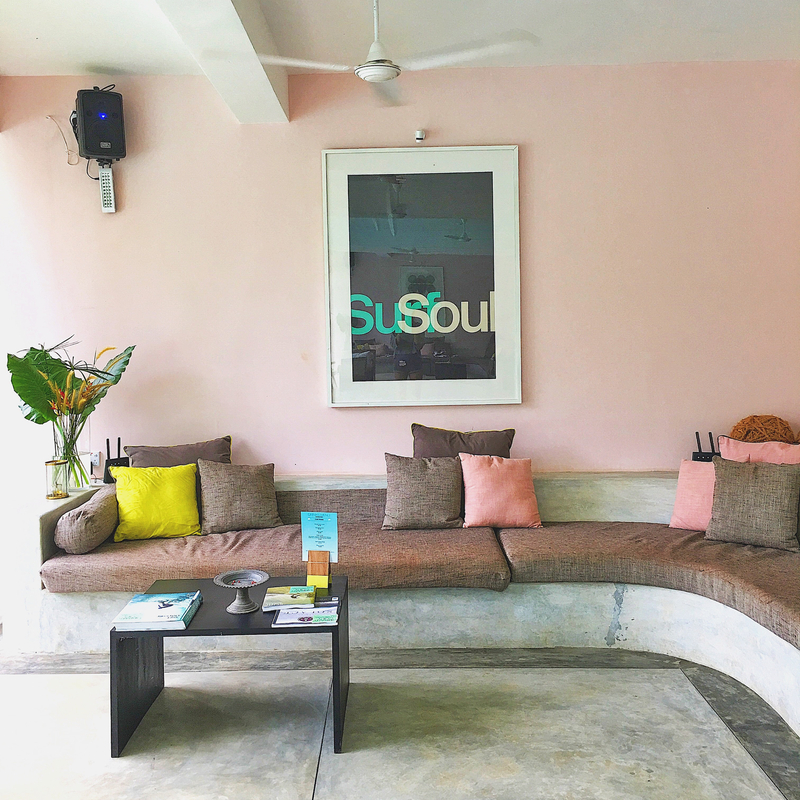 There was ample activity planned throughout the day and massages and yoga session were tailored for pregnancy, I found this extremely helpful. There’s plenty of surf, yoga, and activities for everyone. Our Non Surfer Package is specifically designed for and only available to someone who is sharing a room with a standard package guest. On Wednesday you are free agent and you can plan your own activities. We headed to Galle Fort in a tuk tuk, the drive took about 40 minutes. Galle Fort has hotels, restaurants, boutiques and jewellery shops. Galle Fort, in the Bay of Galle on the southwest coast of Sri Lanka, was built first in 1588 by the Portuguese, then extensively fortified by the Dutch during the 17th century from 1649 onwards. You can arrange your travels plans with the Head of Vibes. Mode of Transport in Sri Lanka a Tuk Tuk. School Children in the rain, Galle Fort. Art work in Galle, Fort. On the final day the group heads to the beach to surf, watch the sunset and enjoy a beer. Followed by this there is a BBQ back at the Villa. Throughout the day you will need to settle any outstanding bills. This can be done with the Head of Vibes.